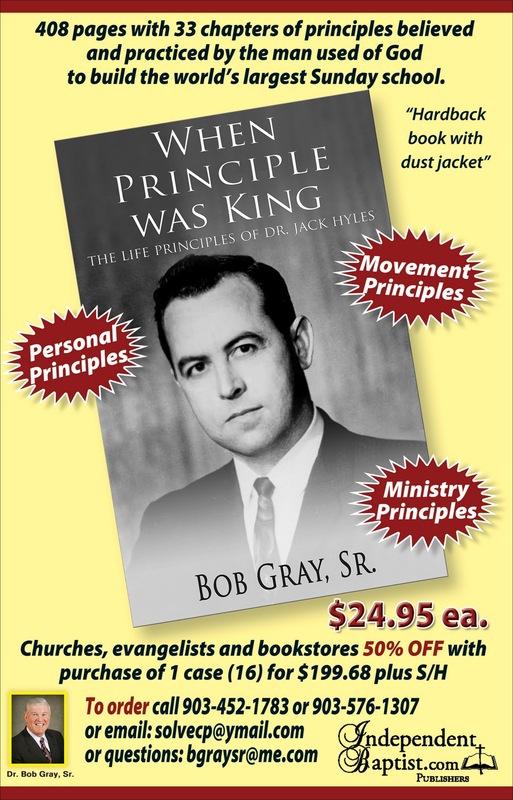 “WHEN PRINCIPLE WAS KING” Books starting to arrive at a church near you! I have begun hearing from those who have their cases of the book WHEN PRINCIPLE WAS KING delivered to them. Here are just a couple of texts and emails I have received. It is not too late to order your case of books or individual book in order to receive a 50 % discount on a case and a 25 % discount on a book, plus S/H. This will only be available through the end of December 2011. You can call 903-576-1307, 903-237-9019. You may also email bgraysr@me.com. This is not a biography. This is a book about the life principles of Dr. Jack Hyles. Practical and applicable! You will learn! GOTTA LOVE THE OLD TIME RELIGION!